Tubmanburg, Bomi County, August 1, 2018: Deputy Minister for Urban Affairs, Honorable Paulita C.C. 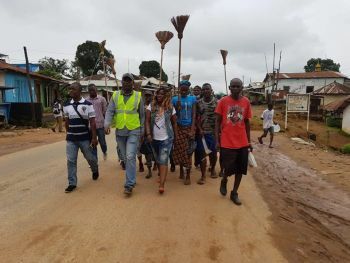 Wie during the weekend climaxed a month-long ‘WEAH FOR CLEAN CITY’ Campaign in Tubmanburg City, Bomi County. The exercise was intended to give the city a facelift. The Deputy Minister also made a personal contribution of thirty thousand Liberian Dollars to the City Government of Tubmanburg along some working equipment. Honorable Wie donated 5 wheel barrels, 10 cutlasses, 30 shovels and 10 rakes among others. According to Honorable Wie, her gesture was intended to strengthen the capacity of the City Team to continue the campaign as part of the Pro-poor Agenda for Prosperity and Development.